Welcome to the Hilliary Beach House! The beautiful Hilliary Beach House is located in the coastal community of Emerald Waters. There are two community pools in the neighborhood and it is a short walk from beach access. This 2,300 sq.ft. home perfectly blends natural coastal beauty with high-end, contemporary design, resulting in an ambiance of peace and tranquility. 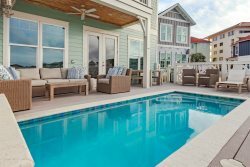 This luxurious open-air villa puts you right in the heart of the best that Destin, Florida has to offer. The Hilliary Beach House sleeps 16 guests, has 4 bedrooms and 3 bathrooms. Upon entering the first floor, feel your worries melt away in shared spaces built for comfort. The interior design reflects a minimalist, coastal elegance. The first level is free-flowing, consisting of your main living, formal dining, and kitchen areas. The living space includes two sleeper sofas. The modern kitchen features stainless steel appliances and plenty of counter space, as well as a breakfast bar which sits 4 guests. The formal dining area provides seating for 10 guests. Make your way to the double french doors where an additional 600 sq.ft. is available for tropical outdoor living — enjoy fresh local seafood on your private BBQ grill while taking in the Florida sun. For sleeping arrangements, there is a King Suite on the first floor with a shared bath. The second level features the Master King Suite with a cheerful design, private bath, and balcony access. This room features a plush sofa for extra relaxation and comfort. The master bath features a garden tub and walk-in shower. An additional King Suite on this floor has a welcoming, nautical design; a luxurious four-poster bed; balcony access; and a shared bath. There is an bunkroom with a twin-over-full bunk bed with trundle, balcony access and a shared bath with the second King Suite. The Hilliary Beach House’s tranquil atmosphere and luxurious interior is sure to meet all of your beach house expectations! *Weddings/Events – Are not permitted at this home due to the rules and regulations of the HOA. *Tents/Canopies –are not permitted on the beach, per the HOA regulations. Pool Heat— From October 1st - May 1st, the private pool/spa can be heated for an additional $50/day or $300/week. Pool heat must be purchased for the entire stay. Margarita Machines — This home is proud to feature a "Destin Firefighters Margarita Machine" located in the home which is available for rentals (for an additional fee). For additional information visit our Margarita Machine page. Grill located on private outdoor patio. Community Pool across the street!